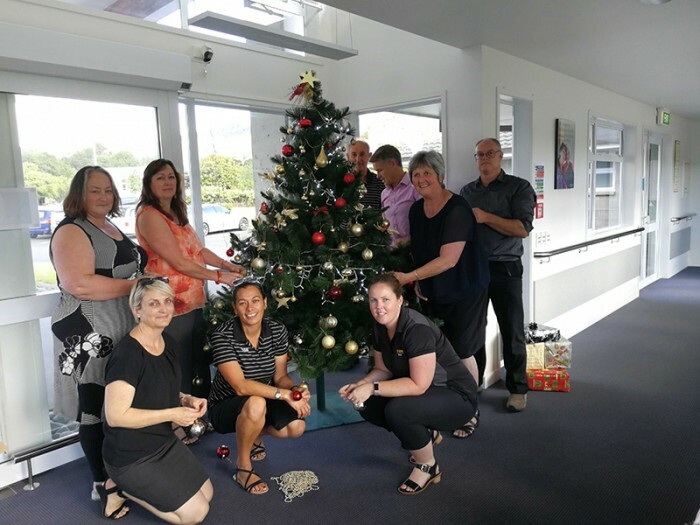 For the third Christmas running, staff from ASB Bank Commercial and Rural teams have been decking out the Selwyn Park Village and Rest-home with Christmas decorations. Recently 8 staff members headed up to Maunu with an 8.30am start, decorating the large Christmas trees at the village. As part of Volunteering Northland's Employee or Team Volunteering program, this initiative is about making lasting connections between corporate and non-profit organisations. Senior Commercial Manager at ASB Bank Fiona Morgan is also the Chair at Volunteering Northland. She says all the staff at ASB Bank love the chance to help with the Christmas decorations. “With a group of us working together we can get this done quite quickly around our work commitments and then of course Selwyn Village provides us with a delicious morning tea”. Like most corporate organisations, staff love the chance to do something meaningful for other groups in the community. During National Volunteering Week in June this year, staff from ASB Branches in Whangarei and Kaitaia also sent out teams volunteering. Part of a garden clean-up project was tackled at CCS Disability Action in Kamo, and Kaitaia Hospice Shop had a team helping out sorting donations. Trish Clarke from Volunteering Northland says "Employee volunteer programmes provide benefits for organisations, individuals, community groups and wider society. Projects broaden a team’s outlook, extends thinking beyond a work desk and is generally fun in the process. Business skills applied to community projects add capacity and new ideas".